Afternoon Paul and thank you for giving up your time for The Social Golfer. Firstly, you don’t need me to tell you, but I think the course playing superbly. The Ryder Cup layout not only provides the event with a natural amphitheater, but I have no doubt that it will also prove a hit with the spectators too. There’s a real sense of theatre about the viewing positions, which will generate a superb atmosphere. So, what’s an Englishmen doing in Paris running a Ryder up venue, how did you get here and what has been your greatest challenge since taking over the helm in 2014? “Well, I was born and bred in Scunthorpe in Lincolnshire and whilst I was an avid golfer, I was never good enough to think about being a golf professional and I never wanted to be an assistant pro. So, I went to Northumbria University and studied international business finance. This included a year in France as part of the Erasmus program, meaning I discovered continental Europe at an early age. Meanwhile, I was there, I was volunteering at a local golf course at the kid’s school and was later asked if I would be interested taking care of the competitions and events…. I did that job for three years, very happily, developing the turnover, membership programme, when a very exclusive private members club approached me to work for them. However, as I was only 27, I was really far too young to take it through the change that was needed at that golf course. As an Englishman, the Continentals assume you know everything about Golf, which of course you don’t but I coped and four years later we had created a Challenge Tour event and many high-end business events. This then became a golf events agency, which turned into a marketing agency. Later I worked for Le Club Golf, which is a network of 130 clubs (in France there is 700+ golf club with 50% of these belonging to a commercial group). 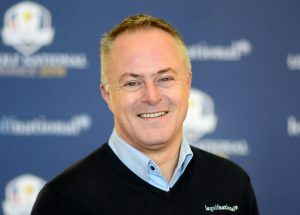 What an opportunity, so what has been the Paul Armitage strategy at putting Le Golf National at the heart of the French Golf network? “It’s been a creative process but ultimately, we can sum this up in a four-letter word. It’s not the one that you’re thinking of…. It’s LOVE! It’s been about instilling this in all the staff minds and the visiting public. (Yes, Le Golf National is a PUBLIC course! – Ed.). This follows through from the marketing staff through to the greenkeepers. The current Greenkeeping team is headed up by hugely talented and young man from Spain, who was working there for Jack Nicklaus design. He also spent long periods in America. He is very passionate about the course and I think he’s brought 15 centimeters of extra sand on both fairways and greens. So as a Public course, what is the business model? “When I started there was little difference on price across our three courses, so we immediately invested in L’Albatros (now circa 120 euros), which appealed to a higher end audience with the L’ Aigle (now circa 60 euros) providing visitors with a more affordable green fee option. This has allowed us to raise the quality of the flagship course hugely. 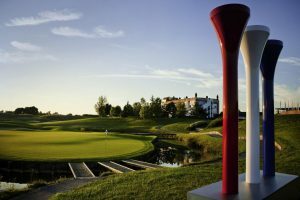 Previously the course has hosted more than 20 French Opens, meaning we are top of mind for French visitors but The Ryder Cup will allow us to reach golfers from further afield e.g. the UK. 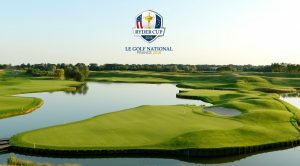 How and why was Le Golf National chosen as this year’s host venue and can you describe the course to potential visitors? “Well one of the things going for us was the course was both established and proven in hosting big European tour events. In addition, it’s also a good reward risk or reward golf course meaning that it is much loved by the European tour players, a big help when convincing the ‘powers that be’ to choose us. Our well-earned reputation was also underpinned by the support from the French government and the French Golf Federation. There was immediate state support ensuring the event was also secure and credible and not a financial risk. In addition, all French golfers were part of a crowd-funding project whereby every golfer paid a levy on their membership fee to the tune of 3 euros per year. Some of these funds were also channeled into the next generation of French academy golfers. The final reason is the proximity to Paris. 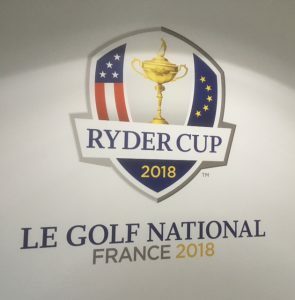 So, if you had to sum of Le Golf National in one sentence what would you say and how much does it cost to be a member and what level of golfer do I need to be to play here? “We don’t have any members. We have a small number of subscribers who buy different Flexi memberships from around. 200 euros a month. However, you have a handicap of 28 or below to play L’Albatros” (very reasonable! Ed.) Whilst it’s unfair to compare any golf course to another, we see Bethpage Golf Club as who we can aspire to be. Let’s talk about the competition, what are you really looking forward to most and what has been your most memorable moment so far? “You know, I haven’t thought about this one. Hmmm…Of course, I am really looking forward to welcoming all the players on the first day. However, I am very excited, about the first day when we will host the BIGGEST ever grandstand on the first tee in the history of the event but there is so much to do between now and then. I guess the proudest moment of my career to date was to be asked to MC at the ‘One Year to Go’ event and Gala Dinner – a very proud moment indeed! But now I think about it, I think there are many moments already which would have been amazing. It’s really a massive honour to do this job. I’m not joking. You know, I don’t do it for free obviously, but it is an achievement in life that you look back on with huge pride. What’s the best so far? Maybe working with the 800 kids in a match between Thomas Bjorn and Jim Furyk. They didn’t actually play with a Captain of the USA and European teams, but they followed the youngsters in buggies with microphones, interviews, that was fun! I am also looking forward to seeing how the teams react, The US team have got a young and friendly generation coming up who were changing things a bit American golf and they have built close relationships with each other than before. Like our guys (European Team) 10, 15 years ago when Rose, Poulter, Westwood, and Rory were coming through, we were a team”. The feeling we get from Bjorn and Furyk is there will be a friendlier atmosphere at this year’s cup but who is going to win? “Hmmm…. I’m going to send that one back to you. You must ask them that. It’s not for me to say. All I can say is they will both want to win! And finally? What is your message to TSGers who want to come and play L’Albatros? “Please come! We welcome all golfers to visit and enjoy a great experience. Play both a Ryder Cup AND the 2024 Olympic Games golf course. And hopefully, you will fall in LOVE with Le Golf National too”. 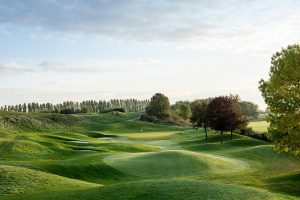 Our TSG Verdict: We couldn’t have been welcomed more by the staff and team at Le Golf National – our thanks to everyone there – we wish Paul Armitage and all his team well for September. We’ll all be glued to our screens cheering you, and European Team on to victory!